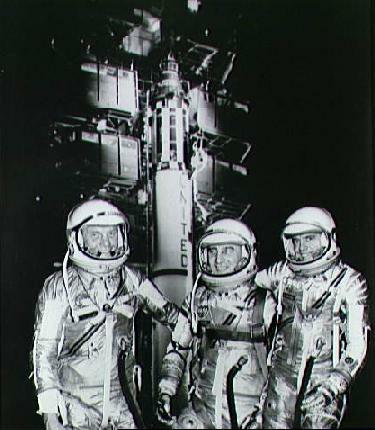 Explanation: Space suited project Mercury astronauts John H. Glenn, Virgil I. Grissom, and Alan B. Shepard Jr. (left to right) are posing in front of a Redstone rocket in this vintage 1961 NASA publicity photo. Project Mercury was the first U.S. program designed to put humans in space. It resulted in 6 flights using one-man capsules and Redstone and Atlas rockets. Shortly after the first U.S. manned flight on May 5, 1961, a suborbital flight piloted by Alan Shepard, President Kennedy announced the goal of a manned lunar landing by 1970. This goal was achieved by NASA's Apollo program and Shepard himself walked on the moon as commander of the Apollo 14 mission. 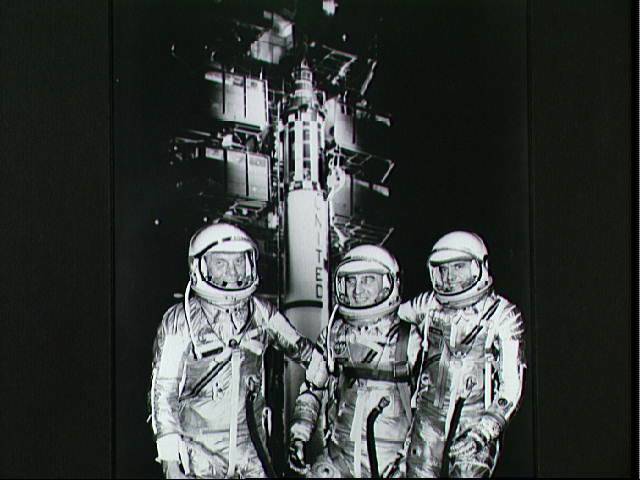 Virgil Grissom died in a tragic fire during an Apollo launch pad test in 1967. Senator John Glenn will fly again on the 25th voyage of the Space Shuttle Discovery.